Kalpana was last seen in Martin Prakkat-Dulquer Salmaan film "Charlie". South Indian actress Kalpana Ranjini, who is known for her comedy roles, passed away in Hyderabad on Monday, 25 January. She was 51. The National award-winning actress was found unconscious in Ebony hotel in the city, where she was shooting for Vamsi Paidipally's upcoming bilingual film "Oopiri", starring Akkineni Nagarjuna and Karthi. She was then taken to Apollo Hospital early on Monday morning and reports suggest that she had suffered a heart attack. The mortal remains of the actress will be brought to Kerala by Monday evening and the funeral will take place on Tuesday. The versatile actress, who began her acting career with MT Vasudevan Nair's "Manju" in 1983, was last seen in the Malayalam film "Charlie" with Dulquer Salmaan. Even though she did a small role, the character Mary was appreciated from movie-goers and critics. Incidently, she was seen committing suicide in the Martin Prakkat directorial. Kalpana is the receipient of National Film Award for best supporting actress for her performance in the movie "Thanichala Njan" and has also published her memoir named "Njan Kalpana". Kalpana is the daughter of theatre artists VP Nair and Vijayalakshmi and is the sister of actresses Kalaranjini and Urvashi. She was married to Malayalam film director Anil Kumar; the couple got divorced in 2012. They also have a 16-year-old daughter Sreemayi. With IIFA Utsavam taking place in Hyderabad, most of the South Indian actors are in the city. Malayalam celebs Mammootty, Mohanlal, Prithviraj Sukumaran, Suresh Gopi, Amala Paul, Fahadh Faasil, Dulquer Salmaan, Jayaram, Indrajith Sukumaran, Asif Ali, Mamta Mohandas, Suraj Venjaramoodu, Kunchacko Boban, Jayasurya, Innocent, Navya Nair, Kavya Madhavan, Aashiq Abu, Alphonse Puthren, Unni Mukundan, Manju Warrier, Stephen Devassy, Meera Nandan, Aparna Nair, Isha Talwar, Babu Antony, Anupama Parameshwaran, Divya S Menon, Ranjith Sankar and many others have expressed their hearty condolences on the death of the actress. RIP Kalpana Chechi! A fine actor and a finer human being! We flew together in to Hyderabad yesterday afternoon..and she was in such high spirits as always! You will be missed forever!!! Wonderful person and a great artist..RIP Kalpana ma.. Distressed to know the news about Kalpana mam. Had the good fortune of meeting her over a flight journey and the conversation with her about life and sensibilities has been memorable. What an amazing soul !! RIP #Kalpana Chechi.You made us laugh, cry and left a void which will never be replaced. Rest In Peace. Extremely saddened by the news of Kalpana chechi's sudden demise.... I had just met her day before yesterday at guruvayoor and she was all smiles healthy and spoke her heart out to a huge audience... this 28th I was supposed to start my shoot with her ... discussed so many things and she was so happy and healthy ... terribly shattered.... sometimes gods ways are way too mysterious for our minds.... I'm happy that I could work with you once and happy that I could know you as a person and will always be a fan of your work.... I still remember how you made the entire guruvayoor laugh their hearts out with your gentle and humble talk ... short of words... just praying that your soul rests in peace !!! You have been a true artist by all means... surely my last memory of you is seeing you spread happiness among others.... sleep well in peace. Still feeling the shock from the news of the sudden demise of our dearest kalpana chechi . Hard to imagine that the kalpana chechi who was on our flight to Hyderabad laughing and joking with us is no more .. Never realize that her good bye kiss and warm hug was the last we could have from her . Deeply saddened, I also convey my condolences to all her family and friends during this hour of grief .. Rest in peace kalpana chechi . Your life was a celebration as you touched the lives of many. We were together in the flight to hyd yesterday . She was laughing and playing with us . We hugged and said bye to her when she went to join her shoot . And it's shocking to hear she is no more . Can't believe .à´†à´¦à´°à´¾à´žàµà´œà´²à´¿à´•à´³àµâ€.. I am so shocked to hear about actress Kalpana 's sudden demise in Hyd.so sudden ,sympathies to sister Oorvasi &family.Great loss of talent. Deeply saddened and shocked to hear the sudden demise of one of my fav actress Kalpana Chechi!what an actress!huge loss indeed!RIP Chechi! 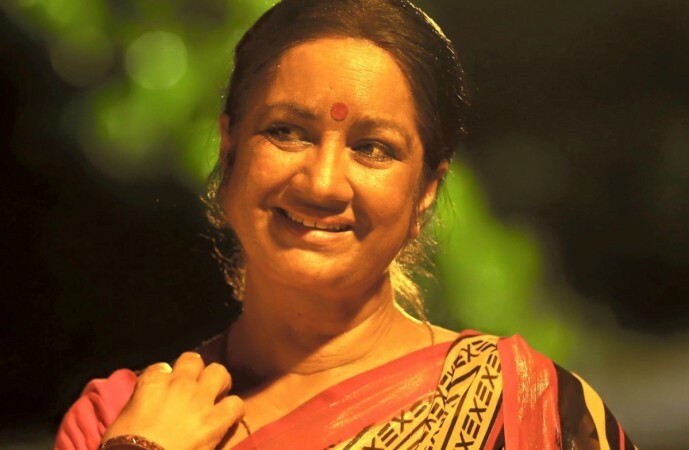 Deepest condolences to #Oorvasi and family at the sudden demise of #Kalpanachechi ,a superb actor n a national award winner..#RIP..
RIP #Kalpana You made us laugh, cry and you left us with a shock. You left a void will never be http://replaced.Rest In Peace. Deeply shocked to hear about Kalpana Chechi. She's made us laugh and she's made us cry. What a void is left. RIP. Shocked and dismayed to hear of her demise. Always the one to surprise us, with her performances, words and her wit - onscreen & offscreen. A consummate artiste - Kalpana. Rest in peace Chechi. RIP Kalpana chechi! You will be missed..
à´†à´°àµ‹à´Ÿàµà´‚ à´ªà´°à´¿à´­à´µà´®à´¿à´²àµà´²à´¾à´¤àµ† à´¨àµŠà´Ÿà´¿à´¯à´¿à´Ÿà´¯à´¿àµ½ à´•à´Ÿà´²à´¿àµ½ à´•à´¾à´£à´¾à´¤à´¾à´¯ à´•àµà´¯àµ‚àµ» à´®àµ‡à´°à´¿à´¯àµ† à´ªàµ‹à´²àµ† à´†à´•à´¸àµà´®à´¿à´•à´®à´¾à´¯à´¿ à´®à´°à´£à´‚ à´…à´µà´°àµ† à´•à´µàµ¼à´¨àµà´¨àµ†à´Ÿàµà´¤àµà´¤à´¿à´°à´¿à´¯àµà´•àµà´•àµà´¨àµà´¨àµ. à´†à´¦à´°à´¾à´žàµà´œà´²à´¿à´•àµ¾.. I had the pleasure of working with Kalpana Chechi!! She was absolutely amazing,jovial,super-friendly and an amazing performer.She said the sweetest and most encouraging things to me on the sets of Bangalore days :) May her soul rest in peace ! Thank you Chechi for passing on your amazing energy !! One the wake of the second day of the first IIFA Utsavam where the entire south film industry came together, I was deeply grieved to hear about Kalpana chechis demise. Shocking .. One moment ur up n running n the very next it's all over. Such is LIFE. The very little time I had spent with her was a flight between dubai and calicut. She was such a fun and energetic person to listen to. Had so many hilarious incidents to narrate. Will miss her greatly and so will the industry. It's saddening to understand that we are losing people who have lived in our hearts thru their work and amazing personalities for so many years. RIP chechi! I don't even know what to say ...shocked and speechless ..Kalpana chechi you will be missed so so much..May your soul rest in peace. Can't believe this at all!! A wonderful fun loving person n a superb human being.... U will be missed Kalpana Chechi..... May her soul rest in peace.. May god give strength to her family to bear this loss!! Really shocking news..my heartfelt condolences..
RIP Kalpana chechi A big loss to film industry. You will be always be remembered in our hearts. She left us.we lost a great artist and I lost someone who was very close to my heart.I have no words.you will remain in my heart forever..!! Oh My God.... This is really shocking.... RIP great actress Kalpana Mam. Still not able to believe it. Met her just yesterday and spoke to her when we were all on the same flight to Hyderabad and she seemed totally fine, and had also said that we should work together sometime soon.. But this is shattering news!